It’s been a busy beginning of the year in the Social eMotions research project. We’ve been working on a number of things, so I thought it would be nice to have an update on where we are, including introductions of new members in our project team! On the scientific side, the main theme has been perceptual experiments. We’ve been running experiments showing people animated clips such as the GIF above, and asking them to rate the dancers movements and their relationship along various scales. We are currently analysing data, and have just started to write up our movement analysis paper, so there’ll be published results soon. On the artistic side, we are working full steam toward the première in Oulu in September. Jarkko and Johanna have been working on the movement material, and we now have also a composer and two musicians working on the music for the show! Jussi Lampela will compose music for the piece, and it will be performed live by two cellists, Iida-Vilhelmiina Laine and Ulla Lampela. We are very excited to have these stars join our team! As the final performance starts to take shape, its key aspects are being planned and put to their places one by one. We are working on ways to let the audience influence the performance as it happens, and on ways to include the scientific results in it. For the latter purpose, we are getting help from Dr Roberto Pugliese in visualisations and projections. We visited Roberto’s studio yesterday and Jarkko took this snapshot of us dancing and Roberto’s system capturing it on Kinect and producing a live visualisation on screen. This will (continue to) be great! Movement data – what to do with it? Social eMotions: movement recordings completed! Click the image for a video clip! 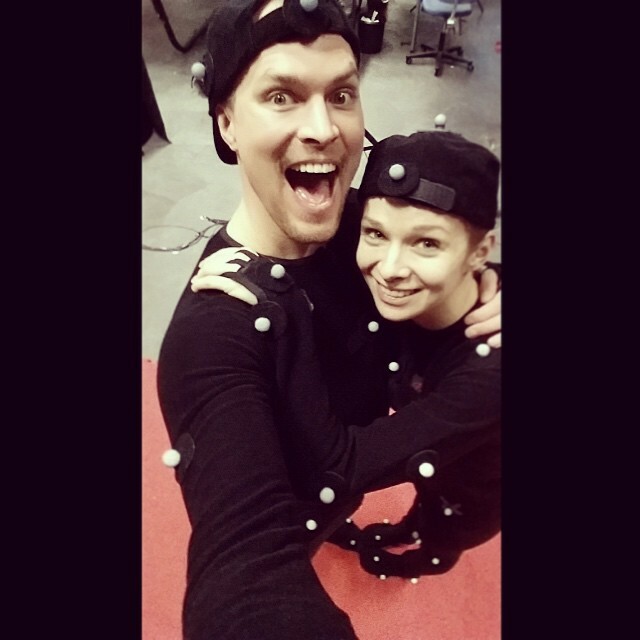 Jarkko and Johanna – our dancers/choreographers are also very excited for the project!